This repair kit includes a quantity of 3 (Three) 9”x 9” Self-Adhesive Patches. They are available in your color choice of green, blue, gray, tan, or black. If you need more than this, give us a call or email for special pricing. This patch kit is intended for rips and tears and/or areas with extreme abrasion. 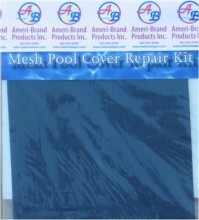 It can be used on any make or brand of mesh pool cover. The patch should extend over any damaged area by at least 1-1/2” on all sides. Trim the hole so the material will lay flat. Remove the self-adhesive backing and apply. Any cover with rips in excess of 7” should be professionally repaired. For more information on our Pool Cover Repair or Cover Duplication programs, please click on the link HERE. This item ships via US Postal Service. Ships only to the lower 48 states. Pool Covers & Domes Online Already. Give us a try! If you're searching for discount sale prices and the best online bargain pricing try our online store. We invite you to compare the quality, value, and warranty of our merchandise. We're proud to be a favorite stop for Do it yourself DIY enthusiasts and professional dealers alike. Looking for replacement parts, accessories, or instructions and guides on how to repair or fix a used or older item, or on how to make a brand new item, our web pages can provide the latest top quality information and relevant product education. Try our free online care and maintenance guide pages to learn about cleaning, storing, and other related procedures to get the most from your purchase. 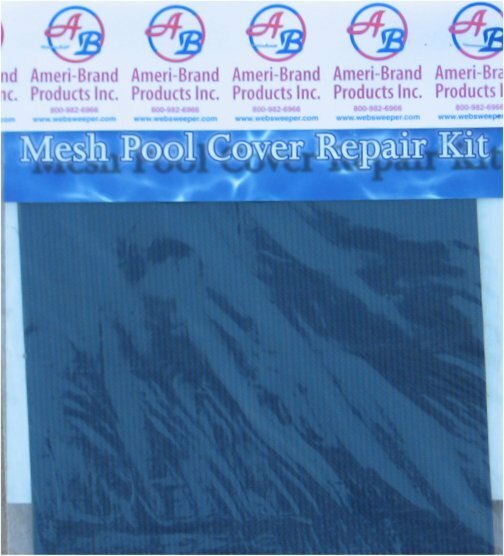 Click the button below to add the Mesh Safety Swimming Pool Safety Cover Repair Kit to your wish list.